You are viewing » Home » About Glebe » History & Heritage » What Does “Glebe” Mean? 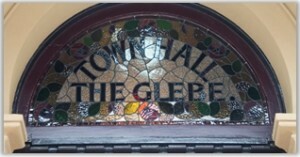 As a part of the restoration of Glebe Town Hall, a new stained glass window was inserted above the main entrance; notably acknowledging the reference to The Glebe. Glebe’s name derives from the fact that the land on which it was developed was a glebe, originally owned by the Anglican Church. ‘The Glebe’ was a land grant of 400 acres (1.6 km2) given by Governor Arthur Phillip to Reverend Richard Johnson, Chaplain of the First Fleet, in 1790. In the 19th century, Glebe was home to architect, Edmund Blacket, who had migrated from England. Blacket built his family home, Bidura, on Glebe Point Rd in 1858. It was designed along conventional Victorian Regency lines. He also designed St John’s Church, on the corner of Glebe Point Rd and St Johns Rd. The church was built from 1868 to 1870. In the Roman Catholic and Anglican Church traditions, a glebe is land belonging to a benefice and so by default to its incumbent (priest). In other words ‘glebe is land (in addition to or including the parsonage house/rectory and grounds) which was assigned to support the priest’. Glebe can include strips in the open field system or grouped together into a compact plot of land. Tithes were in early times the main means of support for the parish clergy but glebe land was either granted by any lord of the manor of the church’s parish, (sometimes the manor would have coterminous boundaries as the parish but in most instances it would be smaller) or accumulated from other donations of particular pieces of land. Occasionally all or part of the glebe was appropriated, devoted or assigned to a priory. Where it was wholly appropriated then these impropriators (of glebe) became the lay rector(s). In the case where the whole glebe was given to impropriators they would become the lay rector (plural where the land is now subdivided) in which case, the general law of tithes would resume on that land, and in England and Wales chancel repair liability would now apply to the lay rectors just as it had to the rector. The amount of such land varied from parish to parish, occasionally forming a complete Glebe Farm. Information about the glebe would be recorded at ecclesiastical visitations in a ‘glebe terrier’ (Latin terra, land). It could also entail complete farms, individual fields, houses, mills or works. A holder of a benefice could retain the glebe for his own use, usually for agricultural exploitation, or he could ‘farm’ it (i.e. lease it, a term also used) to others and retain a rent as income. Funny how the land was ‘given’ to Reverend Johnson by Philip when it wasn’t actually “his” to give away!